The good old practice question. 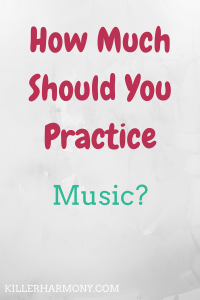 It’s a question that most musicians will ask of themselves or of their teachers at some point. I have thought long and hard about the answer, and there is no right answer. Your ideal practice routine will depend on a number of factors. A professional pianist will probably need to practice more than a beginner. Brass players, singers, and even woodwind players have physical limitations that string players, pianists, and percussionists don’t. So, instead of answering this question, I am going to outline a few things you should consider. Each person will have different needs, so consult your past experience or a professional if you are still confused. If you are just beginning a new instrument, you will not be able to play for as long as someone more advanced. You are still getting accustomed to the instrument, and you may not have much music to work on. For music majors and other serious students, you will need to practice a bit longer than a beginner. Odds are you will have solo pieces, ensemble music, and etudes to work on. You shouldn’t need to practice all day, but make sure you have enough time to make sufficient progress each day. If you are a professional or pre-professional musician, your needs will probably change frequently. During a gig heavy month, you might have to practice every chance you get, but in the off season, you can get away with less. No matter your level, always make it a point to keep up with your fundamentals, such as tone, technique, scales, etc. As odd as it might sound, not all advanced musicians pursue music professionally. If you are well versed in your instrument yet have not plans of a career in music, practice isn’t as important. You should still practice to improve, but you don’t need to be as serious. If you hope to make music a career, then you should definitely practice as much as you can. If you are bored, pick up your instrument and practice. Practicing may sound boring, but if music is your career goal, it will benefit you. Also, your music activities might affect your practice routine. If you have a ton of rehearsals, you may not have the energy that a solo player would to practice for hours. Considering your schedule outside of practicing means you can analyze how much you can practice. Pianists and percussionists, as well as string players, have fewer physical limitations to their practice. Brass players can overwork their lips, singers can risk vocal fry, and reed players can become light headed. If your instrument wears you out after awhile, it is time for a break. Keep this in mind when planning practice sessions. If you have to take breaks, work that into your schedule so that you can get everything done without harming yourself. Each instrument is different, so a violinist and a clarinetist will have different practice schedules. That is normal and expected. This goes off the second point above, but your priorities play a part in your life. If music is your main priority, you can afford to practice more than an amateur. If you want a life outside of music, you shouldn’t worry about not practicing enough. For students, you will have homework and other activities that require your attention in addition to your instrument. Time management will help you do all you need to do. But school should be your first priority. If music is part of your academics, such as for music majors, then focus on the music that you will be graded on. If music is purely a fun thing, that is also great. You can practice as much or as little as you wish. No worries about practice requirements or music related stress. It’s up to you. No matter the role music plays in your life, it’s your choice how much you practice. Certain people will practice more than others, based on their level or their own goals. If you don’t have to practice all day and you don’t want to, don’t force it. If you are a student, you will probably have requirements for your teacher and ensemble directors, but do you. We all work differently, some faster than others. There’s no shame in how you work or how much you practice your instrument. Have you set a practice goal for yourself? Do you time your practice? Let me know in the comments!